To mark the anniversary of ten remarkable years of warmth, friendship and success. A grand celebration was held at K.R. Mangalam World School, Paschim Vihar. It was a time to remember and cherish the glorious memories of a decade long journey which brought us laurels, smiles and a sense of achievements. To enlighten each little soul with fun and entertainment, the school organized various events wherein each student and faculty member participated whole heartedly. To begin the first day of the series of the various events, a ‘ FUN DAY’ was celebrated on 28 Feb 2018. This day was about participation and co-operation, a day full of enjoyment and thrill. Our little Mangalites came in party dresses and they took part in different mind bogging games like ‘Musical Chair’, ‘Lucky Dip’ , ‘Tail a Pony’ etc. Sumptuous food was served to them which they really relished. The biggest attraction of the day was ‘Tapping On Their Toes’. Children enjoyed free style dancing thoroughly. ‘Annual Presentation’ was the next event organized by the school. It was the most anxiously awaited occasion for all of us. It was held on 10 Feb 2018 in K.R Mangalam World School Vikas Puri. 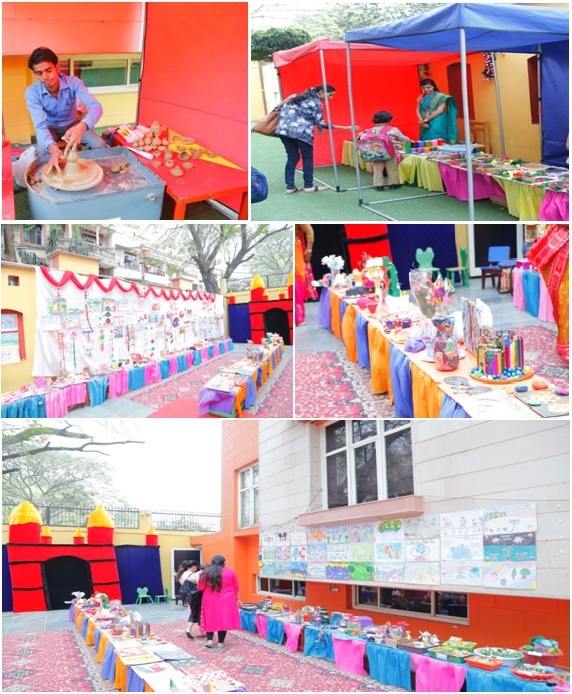 The school got a complete face-lift with all the areas beautifully decorated. Students of Pre School and Pre Primary classes participated enthusiastically in a musical dance ballet showcasing their hidden talents. The kids acting & dancing abilities mesmerized the audience. The grand finale was the highlight of the event. A prize distribution ceremony was also conducted which filled our hearts with pride. To express their feeling and respect towards the school a special program was held wherein each Pre School student shared his/her experiences throughout the session 2017-18. The parents were cordially invited to witness the show. Children showcased their oratory skills and confidence. Everybody was amazed to see the tiny tots on the stage. The dance performances along with it were held to make this event more enjoyable. Primary school children under the guidance of their able teacher were displayed. Be it a table mat, pottery items or a pencil topper everything was conveying the story of artistic hands of a little artist. All these wonderful events marked a completion of a successful decade in a beautiful way, which will cherish its memories in the hearts of the little Mangalites forever.